Medications and supplements are powerful tools for maintaining good health. But they are only effective if taken in the right amount at the right time. That’s why a Medication Checklist is an essential aid for anyone who regularly takes any kind of prescription or over-the-counter medication or supplement. Ever wonder, did I take that today? With a Medication Checklist, you’ll know. And that can mean the difference between optimal health and a debilitating – even life-threatening – health problem. A Medication Checklist is a free template available for download directly from this page. It’s already set up with headings and formulas; all you have to do is customize it for your particular needs. Once set up, the Medication Checklist automatically tracks your daily intake. No more guesswork. An extra benefit is the Printable Weekly Schedule that can be hung on a fridge or mirror as a reminder. Go to the Medications Set Up tab. Enter your medications (don’t forget vitamins and supplements!) along with the required number of daily doses. Track your daily intake. 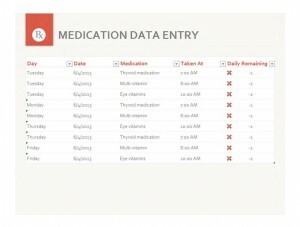 Go to the Medication Data Entry tab and enter day, date, time and number of doses taken. Check your progress. At the Medication Data Entry tab, a green check means you’re done for the day. A red X means you need to take one or more doses. Get a reminder. Go to the Printable Weekly Schedule tab and enter your information under each day’s heading. Print out and post it where you’ll see it every day. Ensure the maximum benefit from your medications. The Medication Checklist lets you record the time of your dose, a valuable feature for those taking medications that must be taken at hourly intervals. Manage all your medications, even treatments for temporary conditions. You can activate and deactivate medications as your needs change. A Medication Checklist puts you in charge of your health by making sure you take all your medications and supplements on time.